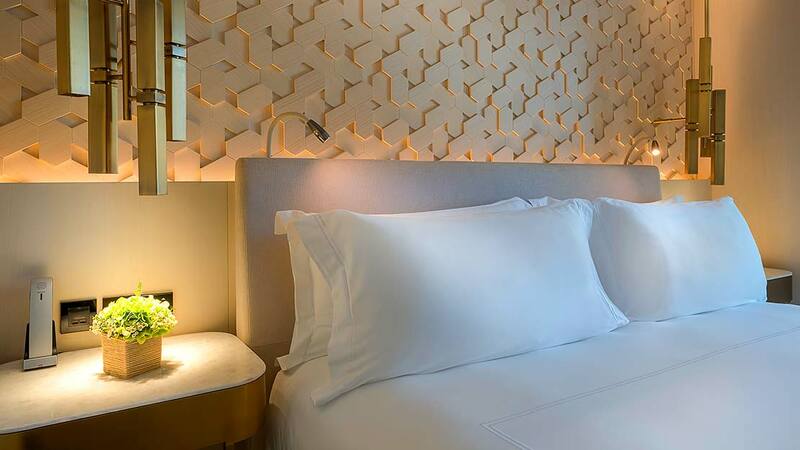 Hailed as the hottest hotel on Palm Jumeirah, FIVE Palm Jumeirah is a dare-to-be-different hotel that captures the glitz and glamour of Dubai. 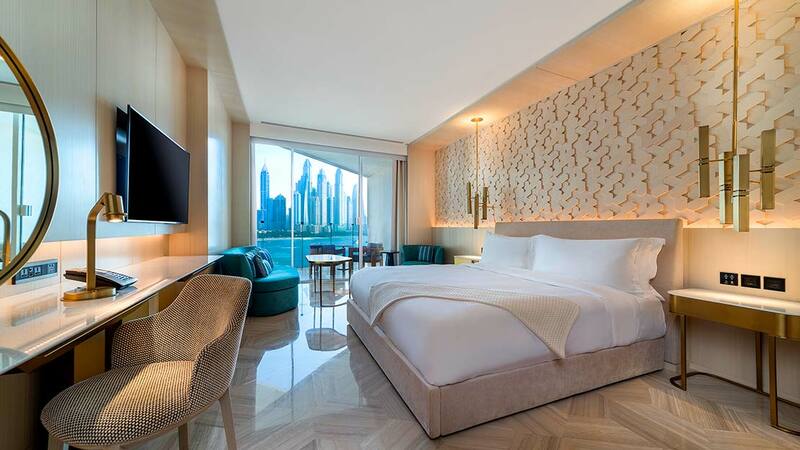 Set against a breathtaking backdrop of the beach and Dubai Marina skyline, this stylish abode boasts 468 lavish rooms and suites with breathtaking ocean or city views. A party hot spot, guests will find a range of bars and nightclubs to experience, including the outdoor roof-top lounge The Penthouse, and Secret Room, an intimate underground Hip Hop and RnB venue. A superb spa is also provided for when it’s time to boost energy levels, with a range of face and body treatments on offer from Natura Bissé, Aromatherapy Associates and Elixir VitaDrip®. Other highlights to enjoy are a sensational social pool and gourmet dining venues, including Chinese restaurant Maiden Shanghai and Italian ristorante Quattro Passi. Guests can enjoy access to the resort’s 100-metre beach with water sports activities available. Situated at the entrance of Dubai’s Palm Jumeirah, FIVE Palm Jumeirah is within easy reach of Dubai’s world-famous restaurants, nightlife, shopping and entertainment venues. A range of outlets and restaurants can also be found opposite the hotel at Golden Mile. Those looking to stretch their legs during their break can enjoy Al Ittihad Park’s 2.7km rubber running track, or enjoy the sea breeze at Palm Jumeirah’s famous coastline, both located within walking distance of the resort. FIVE Palm Jumeirah is a 30-minute drive from Dubai’s two international airports. 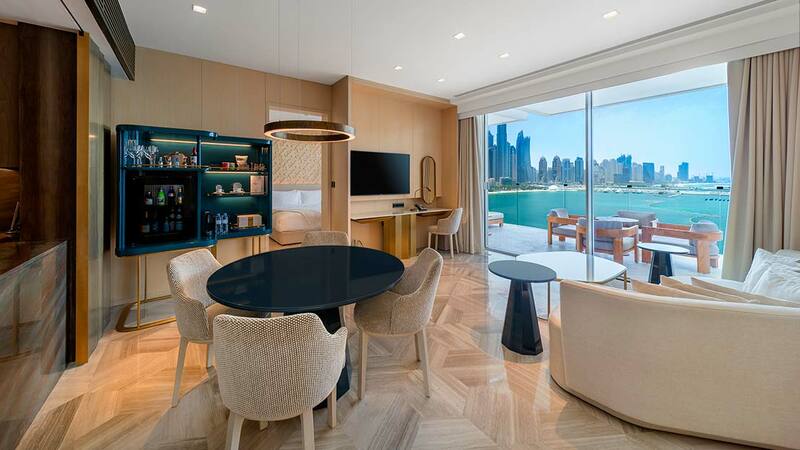 FIVE Palm Jumeirah’s entry level rooms are anything but standard with king size beds and balconies. 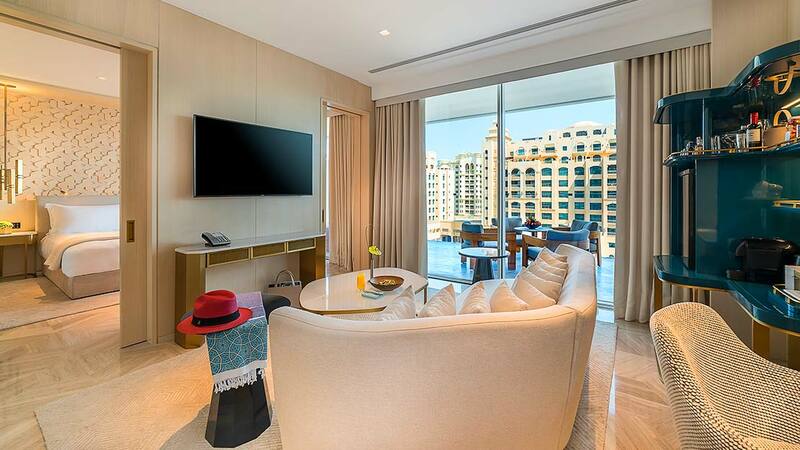 Watch the sun rise each day in these east facing rooms, offering magnificent vistas of the Arabian Gulf and Dubai Marina. 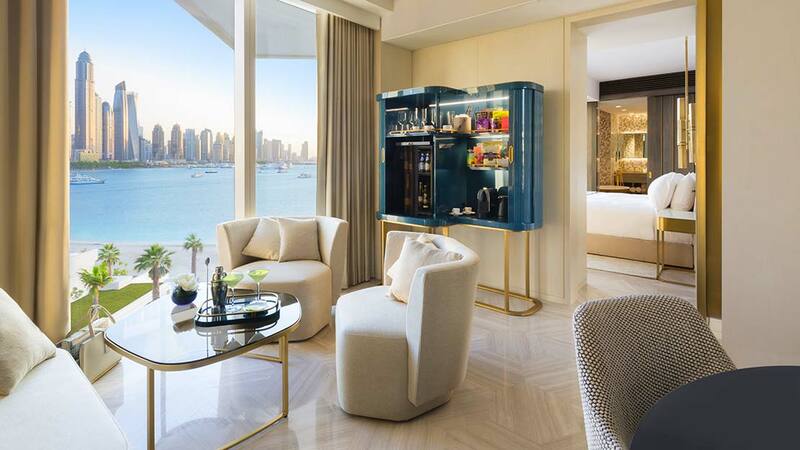 The junior suites at FIVE Palm Jumeirah are simply breathtaking, with all the luxuries of our rooms, plus the indulgence of extra living space, which helps to create an airy and relaxing ambience. One- and two-bedroom suites can accommodate up to 5 adults and are located on the top four floors of the hotel. These suites feature a fully-fitted kitchen, making it ideal for family and friends who want to indulge in style. This suite is large enough to accommodate 8 adults in stylish extravagance, making it the perfect option for larger parties of family and friends. 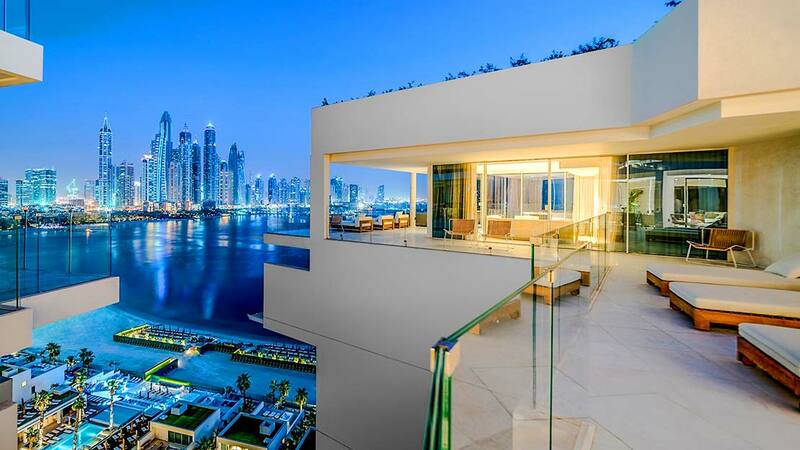 Residences at FIVE Palm Jumeirah is a four-bedroom lifestyle apartment located on the 16th floor. 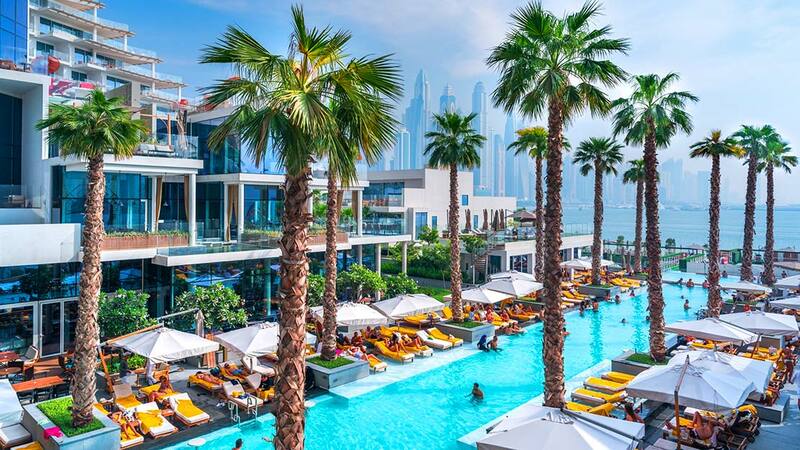 Offering a luxurious get away, key features include a private terrace complete with 10-metre pool, personal butler service and convenient access to FIVE Palm Jumeirah’s culinary hot spots, private beach and lively social pool. What more could you ask for? A haven of fun, relaxation, dining and drinking, FIVE Palm Jumeirah knows how to throw a party with an event taking place every day of the week. Look out for an exciting lineup of DJs, activations, entertainment and more. Ladies can enjoy three complimentary drinks at The Penthouse, whilst experiencing the best views the city has to offer. Every Tuesday, 6pm to 9.30pm. Brought to you by the global party brand behind the multi award-winning Candypants Brunch comes Dim Sum Disco, a high end, high energy dining experience serving up exceptional contemporary Chinese cuisine alongside their famous electric party atmosphere. Every Friday, 1pm to 8pm, at Maiden Shanghai and Maiden Terrace. 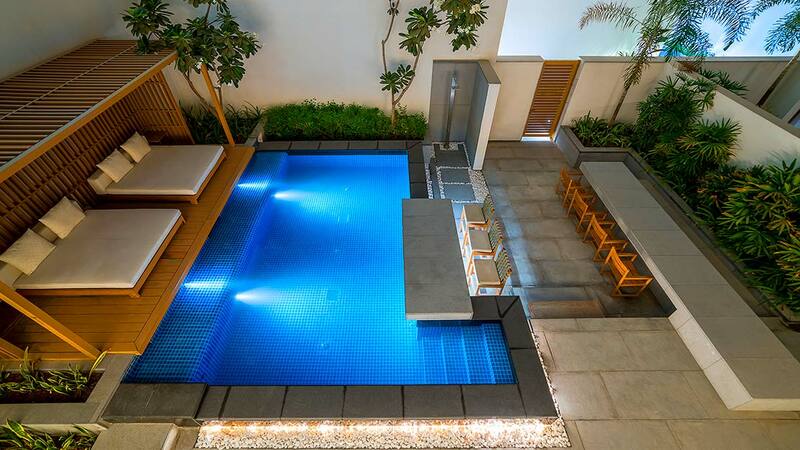 Drink, dine and take a dip at the ultimate sun-soaked pool party. Expect a fusion of fashion, music and cocktails overlooking the breathtaking Dubai skyline, together with a showcase of some of the hottest boutique brands from around the world on our Catwalk in the Sky. Every Saturday, 12pm to 5pm at The Penthouse. Sit back, relax and watch the sun set over Palm Jumeirah as you sip on cocktails and listen to the Balearic beats of Mykonos favourite DJ, NSI. Every sunset from 4pm onwards. Don’t miss out on Skyline Pre-Party, at The Penthouse, offering unlimited house drinks, delicious Japanese and international foodie delights and tunes from resident DJ NSI. Stay for Skyline Thursdays, featuring the crème de la crème of international DJs, and dance the night away until 5am. There is also a live shwarama and skwere station. Every Thursday, 9pm to 5am. Located on the 16th floor, The Penthouse is a lively adults-only rooftop day club and evening lounge, offering spectacular views of the stunning Dubai skyline. Dine on modern Japanese food and dance the night away at ladies night, retro night or our flagship night, Skyline Thursdays. FIVE Palm Jumeirah’s contemporary gourmet Chinese restaurant, Maiden Shanghai revitalises culinary tradition by drawing from Cantonese, Sichuan, Shanghai and Beijing influences. Come and join in the fun at the award-winning Candypants brunch every Friday or sing along to your favourite tunes at the dedicated karaoke room. This authentic ristorante is a must for Italian food lovers looking to experience a real taste of the Amalfi Coast. Expect all of the classic flavours of Southern Italy in an unpretentious, poolside setting. This lively, all-day dining restaurant is the go-to place for FIVE Palm Jumeirah’s delicious breakfasts. The seasonal menu offers a range of dining flavours from around the globe, ensuring everyone is taken care of throughout the day.